Panien articulated lime spreader. J M M at Sima Show, Paris, 1990 03 07. Mechanics and cab comes from RVI (Renault Trucks). Lime spreader HAMM. J M M at Sima, Villepinte, February 1997. Bell B30D dumper. J M M at Intermat, Villepinte, May 2003. 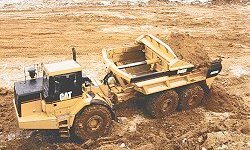 Bell B25C Dumper. J M M at Intermat, Villepinte, May 2000. Dumpers 6x6 articulated : Terex, Furykawa, Ammann, Volvo. J M M at Intermat, Villepinte in May 1991. Foremost Delta 3. It belonged to Linelec. J M M at Murolles en Hurepoix in December 1983. Sifor Harvester 6x6 is equipped with active roll control and actuators to move the suspension arms. J M M at Forexpo, Bordeaux, 2002. Moxy dumper, Intermat, Villepinte, May 2003. 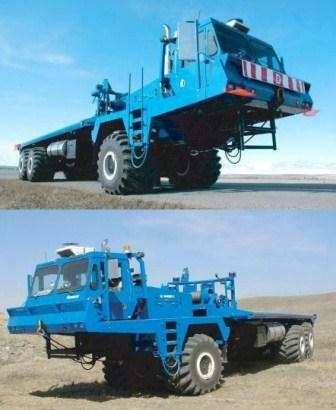 DDT Engineering 630 B 6x6 Ejector truck. J M M at SIMA in April 1997. DDT was created in 1994 in UK in North Yorkshire by Gordon Brown. This truck was sold in 2009 in Case and New-Holland liveries. 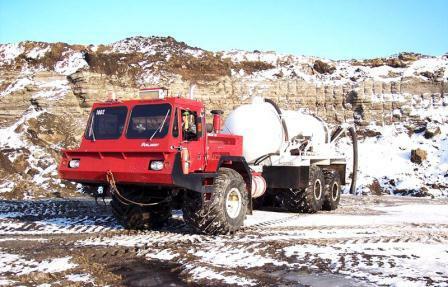 MAZ-MAN Elnya articulated 6x6 since 2008, 156 hp engine, limited slip differentials, consumption 55 l/100 km, 3t payload for 9 t mass.Low pressure tires for snow or swamps http://truck-auto.info/maz/386-elnya.html. Foremost Delta 3 6X6 in the 80s, from Foremost Industries LP, Calgary, Alberta. GMC 2,5 T with front dual wheels. J M M at Loco en Fête, La Ferté Alais, May 2000. Berliet Gazelle GBC 6x6 from 1957. J M M at Loco en Fête, La Ferté Alais, June 2002. Werklust MW 11, custom built in The Netherlands. Pict from 'Camions Magazine', Dec 1983. 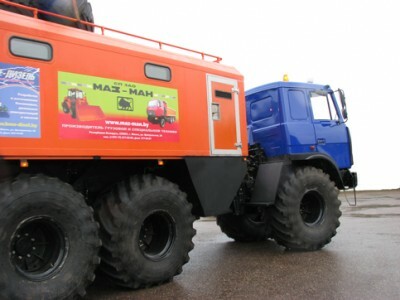 MAZ-MAN Elnya 6x6 articulated vehicle since 2008. Mass 9 T for 3 T capacity. Low pressure tires for swamps or snow. Power 115 kW. http://truck-auto.info/maz/386-elnya.html.